I have seen these Devil's Food Cupcakes around but never get to bake them. Yes! they're devilishly good and rich! This is a classic American chocolate cake, and I guess it get it's name because it is very dark and decadent? I have been very busy lately, and would have missed this week Bake Along if not for reading Ann's post. I like she adapted the recipe and used yoghurt in the cake and frosting. 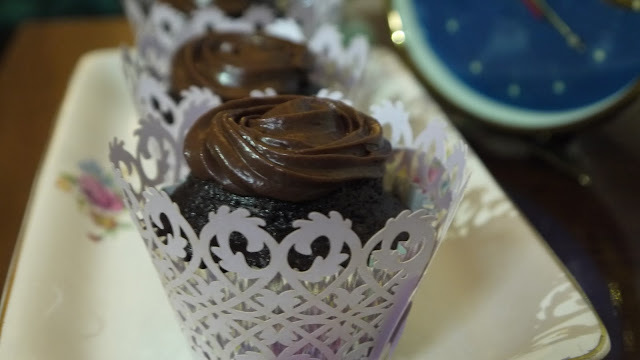 These cuppies are definitely healthier than most other chocolate cupcakes. Preheat oven to 170C and line muffin cup with paper liners. Combine cocoa powder and chopped chocolate together and pour boiling water over it and whisk till smooth. Whisk in the yoghurt. In a separate bowl, mix flour, baking soda, salt together. Set aside. Using electric mixer, beat brown sugar, oil,sugar, egg and vanilla until light and creamy. Beat in the flour mixture, alternating with chocolate mixture in additions. Scoop batter evenly among paper liners. Bake for about 18 minutes (20 minutes) or until tester inserted comes out clean. Let cupcakes cool in the pan and cool completely before frosting it. Stir chocolate and butter in a medium bowl over simmering water until melted and smooth. Remove from water and whisk in yoghurt and vanilla, then icing sugar. Let stand until thick to spread or put in the fridge to fasten the process. Fill a pipingbag with Wilton nozzle star tip 1M and the chocolate cream. Pipe a circular swirl design on the cuppies. 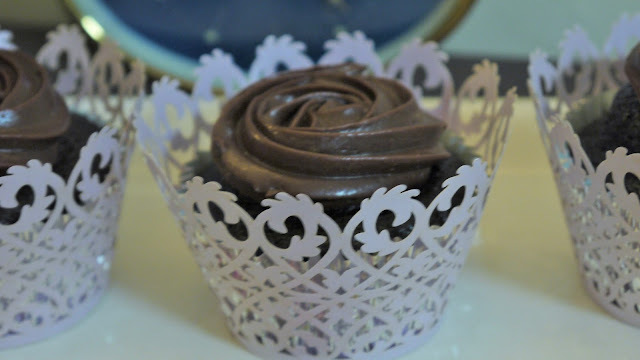 This post is linked to Bake Along 83 Devil's Food Cupcakes hosted by Zoe from Bake for Happy Kids, Joyce from Kitchen Flavours and Lena from Her Frozen Wings. Your cake looks "delish"! In the most delicious way! And I like your cupcake outer casing, very pretty! So glad that you could bake along with us! Oh yes your cupcake liners are so pretty! 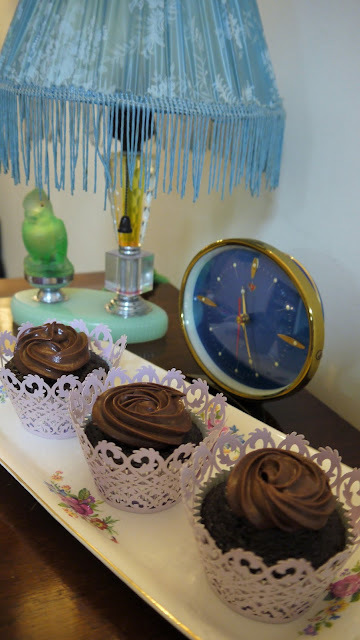 Love your presentation of these chocolatey cupcakes. .. so pretty & elegantly "dressed". hi lian, thx for your comment on my blog. I'm very good, thanks for asking. Hope everything has been keeping you well too and glad that you were able to find time to bake these luscious cupcakes wih us! yes, agree with the rest that your cupcake liner make the cupcakes look very glamour!! Happy that you like these cupcakes! Yours are beautiful!